Here's a new one! 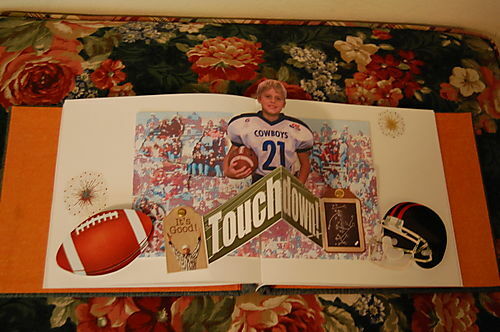 (07/19/08) We had Camp Nana here last week and one of the activities I did with Tyler was to construct the pop-up page for the football section of his Sports album. Ed and I scoured the greeting card section of the grocery store to find a suitable spring to give the football (lower left) a little bounce when the spread is opened. Brads enable the two tags to twist when the "Touchdown" banner opens and closes. Tyler's photo has been modpodged to a sturdy chipboard and is on an "engineered" pop-up tab so that it stands between the two pages when opened.